First things first: prompted by Stephie's post about what to do with old needles I considered my own. It was not a happy experience. I have an extensive collection of blunt, or bent or both, plus two of those John James pebble things, which turn out to be stuffed full of old rejects and another packet (new, I thought) which also contains a sad range of decidedly dodgy offerings. Turns out I have been sewing with duff needles so long I had stopped noticing. So I have treated myself to new ones, and not just the basic cheap ones that I usually get, but pretty, slightly up market needles. Not only does the packaging please me quite inordinately, but I am thoroughly enjoying the novel experience of sewing with a straight, sharp needle. Right now I am busy quilting the piece I did for the Crafted Applique blog hop. It wouldn't be top of my list of priorities in the general scheme of things, but when were 5 year olds known for their patience? So I am taking the road of least resistance and getting it done. It won't take long. I am just outlining the shapes and will leave it at that. As the picture below shows, my quilting stitches are right next to the ones I did to hold everything down; if I did this again, I would just sandwich earlier and use one set of stitches to do both jobs. Ooh, love the look of those needles! 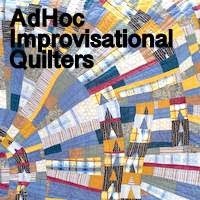 I'm going to Quilt Canada on Friday and I think I will put new needles on my shopping list! I too would have been very pleased with that packaging! We have a lady coming to our club to do a talk on needles and thread in a couple of weeks so I am hoping to learn a lot and then be able to buy some new needles for myself at Festival of Quilts. I put all my old pins and needles in an old glass herb jar. I have been looking at Tulip needles too, but I haven't found a convenient source yet. I didn't realize your daughter was still so young. She is going to treasure this! Definitely worth putting to the front of the queue. Can't wait to see it done! I saw the new needles you are using at a new quilt shop in Las Vegas and thought about purchasing them, but ended up with material instead. I may just splurge next time I'm there and get them. I think I love the packaging of the almost more than I love the needles. They are nuce.and sharp, but I can't seem to use all sizes in the package. Enjoy. I love your little cats. Oh such lovely needles. I wish manufacturers would all produce lovely quality needles, I would happily pay more. I use John James which are nice but don't come packaged like yours. Your post and the comments from fellow bloggers made me smile, why because I too thought nice packaging! Very fun container for needles! I always treat myself to a little pack of needles whenever I'm out and about, so I will watch for these! I love that needle packaging. I have to say that more than likely all of my needles need replacing. Your blocks look bright and lively. Did you do raw-edge applique? And if so, what will happen when you wash this quilt? Are the pieces backed with something that will prevent fraying. (I'm relatively new to applique and have only done turned-edge so far.) Thanks! We're supposed to change out our needles???? We aren't supposed to use bent ones? Or use them in more than one project???? I suppose that goes for sewing machine needles too, huh? I know a Japanese lady who told me about Hari-Kuyo - Festival of Broken Needles. Have you heard of this? I was just looking at those same needles today and had some in a cart. I hesitated to get them because of the price. Do you think they are worth it? I know I deserve them, of course...but can I justify the price??? How did you feel that they handled??? It's so surprising that you haven't been doing your hand stitching with nice needles. Well hooray for treating yourself to new ones Kaja! I love the close ups of Eden's quilts!